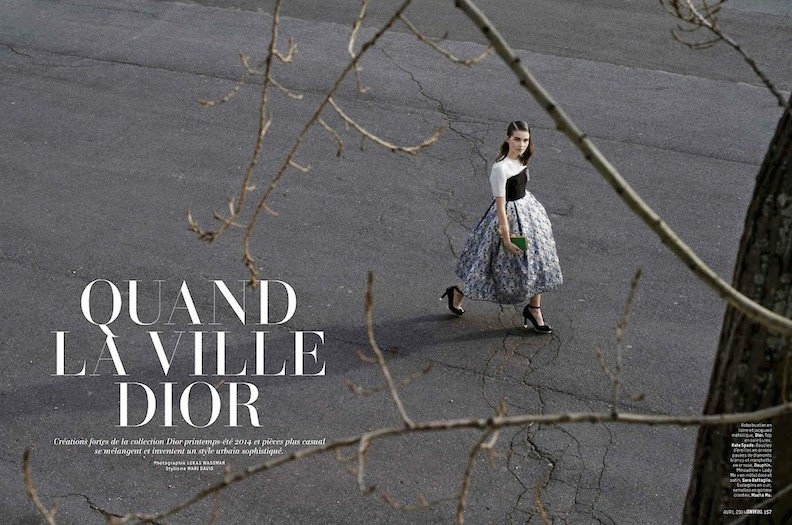 Hanna Sorheim by Lukas Wassman for L'OFFICIEL PARIS, April 2014 IN "QUAND LA VILLE DIOR". Mari David styled Hanna in Dior, Junko Shimada, Kate Spade, Fendi, Jerome Dreyfuss, Maison Fabre, Burberry Prorsum, Delfina Delettrez, Clémentine Henrion, Wolford, Topshop, Charlie Le Mindu, Joseph, Monki, DKNY, Emilio Pucci, Mellow Yellow, Falke, Emanuel Ungaro, Annelise Michelson, Céline, Guess Jeans, Maison Martin Margiela, Viktor & Rolf, Nike, Acne Studios, Gerard Darel, 3.1 Phillip Lim, Dior Joaillerie, Dior Horlogerie and Louis Vuitton . Photos: Lukas Wassman for L'OFFICIEL PARISvia Mo.Mo.